From bestselling author Joe Vitale! Why just want it...when you can HAVE IT. Why just imagine it... when you can SEE IT. Why just attract it...when you can CREATE IT. GO BEYOND the Law of Attraction to the LAW OF CREATION... and step into a world where opportunities manifest spontaneously. Where you align with the universe automatically. Where you don't have to wait for the things you want to come to you — THEY'RE ALREADY HERE! "Just when you think you understand how the world works, Joe Vitale comes along and takes you to a whole new place." In 30 days, life as you know it will be over. This is not a metaphor. You will look around and literally see the actual, concrete, material things you want. They'll be right there in front of you. Close enough for you to reach out and grab with your own two hands. It's real. It's going to happen. In 30 days. And nothing will ever be the same for you again. Only because you don't know how to make it happen. Yet. If you'll stay with me for a minute, I'll prove to you that a transformation that profound and that fast is not only possible. Under certain conditions, it is INEVITABLE. I won't ask you to suspend your disbelief. This is an appeal to your logic and reason. And I won't ask you to accept any outlandish ideas. Only the notion that there are some extremely powerful forces at work in the universe. And that you are one of them. As I said, stay with me. I promise you'll be glad — no, make that ecstatic — that you did. A few years ago, I was part of a little something called The Secret — the book and film that awakened the world to the Law of Attraction. That experience changed my life. I've watched it change millions of other lives. It was, and still is, the most incredible thing I've ever been connected with. "Is the Law of Attraction as powerful as it gets... or is there something even BIGGER?" The Law of Attraction states that your unconscious desires and beliefs pull things into your life. Which means that those things already exist, right? What you want is "out there" somewhere. The only thing between it and you is distance. You start moving your desires across that distance when you correctly apply the Law of Attraction. And that's fantastic. But what if you could shorten that distance? I knew it could be done. All the mechanics were in place in the universe. To find the answer, I had to crisscross the globe, go places I'd never heard of, and seek out the wisdom of masters so hard to find, I began to doubt they really existed. But it was so, so worth it. There Is Something Bigger. MUCH Bigger. ANOTHER law. One I've never heard anyone talk about anywhere before. This law doesn't take the place of the Law of Attraction. Just the opposite. It won't work without it. With the Law of Attraction, the things you want start making their way toward you. When you add this OTHER law into the equation, the things you want ARRIVE. In more than 35 years, it's the most remarkable thing I've ever experienced. A tool of unparalleled power. YOU need to experience it too. Paradigm is a word that's thrown around a lot these days, not always accurately. Let's set the record straight now. A paradigm isn't just a way of thinking. Or believing. Or feeling. A paradigm is an entire way of being. Most people operate in a "scarcity paradigm." When they look around, they see lack. Lack of money. Lack of time. Lack of love or health or happiness. You can be rich or poor and have a scarcity paradigm. You can be healthy or sick, in a relationship or alone. It makes no difference. Because in a scarcity paradigm, whatever you have is less than you want or need. And you don't see a way to permanently fill the void. "There's only so much to go around"... "It won't last forever"... "I need to get my share"... phrases like these are dead giveaways of a scarcity paradigm at work. It's not a situation-specific perspective. It's a fundamental universal conviction that reverberates out into the universe and literally blinds you to the opportunities for fulfillment in your midst. Because a paradigm goes so much deeper than thoughts or even beliefs, you don't "think" or "believe" your way out of your paradigm. Actually... it's much easier than that! You can quickly and cleanly "exchange" your scarcity paradigm for its polar opposite: an ABUNDANCE PARADIGM, in which the things you lacked become available to you... the things you needed are presented to you... and what you had "not enough" of, you now have MORE than enough of. The process by which this exchange occurs takes place on a deep unconscious level. You have to be guided through it. The steps are very, very specific. They must be executed with absolute precision. But when you make the exchange, everything around you, your entire reality, changes too. Right in that very moment. Things that didn't seem to be there just moments before— a car you've always wanted to own, the amount of money you needed to afford a vacation or pay a bill, the perfect job opportunity— will suddenly be visible to you. It's not a mind trick or a matter of attitude. Before, you were in a reality where those things were truly not available. Now, you're in a different reality where they ARE available. By switching paradigms, you set off a kind of "trigger" that activates the law I mentioned earlier— the extraordinary LAW OF CREATION. Imagine looking through a keyhole at a room filled with incredible treasures. You can't see much through the little hole. But what you can see amazes you. Things that would make you wealthy, healthy, and happy are there, right in front of your eyes. What's separating you from them seems so flimsy. But though you try and try, you just can't get through. Then, all of a sudden, the door opens. Now you can see everything. It's even more amazing than you'd thought. Filled with gifts and opportunities you couldn't see before, possibilities you'd never dreamed of! A whole world of riches— and there's nothing separating you from it any more. You're in the middle of it, surrounded by it everywhere you look. That's exactly what happens when you switch from a scarcity paradigm to the Abundance Paradigm. Just like that, your view of what's possible goes from narrow to infinite. Your access to what's available goes from restricted to unlimited. And because you've activated the Law of Creation, you have the power to reach out and grab it. Anything you want, any time you want to. There's really nothing else like it. Your Paradigm Will Shift in REAL TIME! I take you through this reality-transforming shift in my program, The Abundance Paradigm: Moving from the Law of Attraction to the Law of Creation. It's the most exciting and by far the most experiential program I've ever created. Yes, I'm ready to receive total abundance - here and now! I can try it today RISK-FREE! The first is, of course, the conscious level. You'll be hearing my voice and following along with my guidance and instruction. Your waking mind will be processing and contemplating what I'm saying. At the same time, miles below your consciousness, a series of phenomenally dramatic changes will be taking place. The negative programming, limiting beliefs, and false ideas that keep you stuck in a scarcity paradigm will be erased — completely swept away — and replaced with the elements that form a paradigm of abundance. All of this happens very quickly, in real time. While you're listening! Which means you get results immediately. There's no waiting period. I traveled from Hawaii to Russia, from Poland to Peru and further in my quest to discover what lay beyond the Law of Attraction. Every master I met instructed me in a different technique, working with me until I understood every intricacy of the subconscious process that was taking place. Each of these techniques is enormously powerful in its own right. Because each one targets and clears a specific building block of the scarcity paradigm. Together, though, they form a comprehensive system that will knock ALL of those blocks down, one by one. Dismantling your paradigm of scarcity and replacing it with a paradigm that empowers you to see and receive all the abundance the universe contains. I've never brought them all together in one program until now. In fact, there are only a handful of people in the entire world I've shared all of them with. Select students whom I felt were ready to move up to this unprecedented new level of manifesting and miracles. Or You Won't Pay a Single Dime! You'll know right away if the techniques in The Abundance Paradigm are "working" for you. Go through any of these exercises just once, and you'll feel the difference in your outlook... hear the difference in the things you say... and, most importantly, see the difference in the things that are suddenly THERE in your life. Use them repeatedly, and you'll lock yourself so securely into the Abundance Paradigm, you'll never experience scarcity again. Ever. But I don't want you take my word for it. I want you to try this program for yourself. And I want you to do it at absolutely NO RISK to you. Order The Abundance Paradigm today. It's fast and easy. All you have to do is click on the link below. If you don't experience a radical paradigm shift and visible results after listening to this material and going through the exercises, you can return this program anytime within 30 DAYS and receive a FULL REFUND of the purchase price. No questions asked! What exactly can you expect once you shift into the Abundance Paradigm? That's easy. What is "scarce" for you now? What don't you have "enough" of? What's missing from your life? What are you longing for? What do you need? That's what will show up once you step into abundance. The simple, incredible, beautiful truth of the universe is, everything you want and need is available to you. And there's always enough. You can't see it now. But you WILL see it soon. And you will be AMAZED. P.S. How easy is it to change your paradigm from scarcity to abundance? How easy is it to unleash the Law of Creation? It couldn't be any easier! I've designed it to work on levels below the conscious mind, to affect deep inner change just by listening to my voice. That's right! All you have to do listen. Click on the link below now, order The Abundance Paradigm RISK-FREE, and find out for yourself! Yes, I'm ready to receive total abundance— here and now! 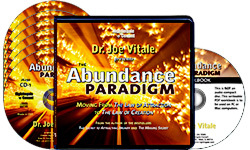 Please send me Dr. Joe Vitale's bestselling 6-CD audio program The Abundance Paradigm: Moving from the Law of Attraction to the Law of Creation, plus the Writable PDF Workbook for just $59.95, which is $30 OFF the regular program price. My order today is completely RISK-FREE! If I don't immediately see and receive MORE of what I want after using these techniques, I can return the program any time within 30 DAYS for a full refund of the program price -- no questions asked! One of the most popular Nightingale-Conant authors of all time, Joe Vitale is the creator of the bestselling audio programs The Missing Secret, The Secret to Attracting Money, and The Power of Outrageous Marketing. Joe was also a featured contributor to the hit movie and bestselling book, The Secret, and is considered one of today's foremost authorities on manifestation, attraction, and abundance. Joe Vitale has personally coached thousands of people to profound spiritual breakthroughs and massive material success, helped facilitate hundreds of thousands more transformations through his world-renowned seminars, and directly impacted millions of lives for the better through his audio programs, books, and movie, television and radio appearances. Joe's mission in life is to help YOU live the life of your dreams! "Whether he's speaking to an intimate group or a crowd of thousands, Joe Vitale connects with people at the deepest level, emotionally and intellectually. I've seen this connection literally change lives, including mine."